Thank you for all of the amazing response to my Weekender bag. I think that project may be my best-loved project to date in the social media world. I really appreciate everyone's generous comments and encouragement! I am definitely on a serious bag making kick. This week I learned of a friend going through a very difficult time. I had already grabbed a yard of this Melody Miller fabric in canvas off of the #thegreatfabricdestash with her in mind because she loves horses. (It turned out I needed more than one yard- which was a pain but I was able to get more at an LQS). I already had the Anna Maria Horner Art Student Tote pattern on hand too and I got to work. This pattern's difficulty level is much more easy than a lot of bags I have made but I still managed to have some issues, thanks to user error. See those pretty front pockets? I originally cut the horse fabric for those pockets and got it all sewed together but changed my mind because it's such a novelty fabric and it bugged me that my pieces didn't perfectly center a galloping horse. I didn't like having horse butts being the only pieces of the horse that you could see in some places. Luckily I had two fat quarters of this minty gold metallic fabric to use instead. I also had major issues with the strap- it should NOT have been so difficult! The strap is supposed to be a 128" loop and somehow I managed to make it 92"- a full yard's worth too short! That was not fun to fix. After I fixed that, I later realized that I had resewn the strap twisted! So I had to unpick some of it again! I didn't use the templates as instructed. I measured the pieces and cut my fabric with a rotary cutter. This was quicker and I think I did it in a way that resulted in less waste. I skipped installing a magnetic snap- those little things would not be very helpful, in my opinion, in keeping this HUGE bag closed. I added an interior zipper pocket on one side of the lining. I didn't even try to sew on top of the metal zipper teeth in one small section- that is a recipe for a broken needle (or worse!). There was no avoiding this and I am not sure why the pattern didn't address this. I changed the way I sewed the large interior pocket panels to avoid having a raw seam edge poking up inside every pocket- I simply folded and ironed one edge of the panel 1/2" in, sewed the other side per directions, and sewed the folded edge onto that seam line: encasing the raw seams. I love the look of this bag! I hope I can find the time to make myself one this summer. It's a very unique look compared to the other bags I've sewn before. 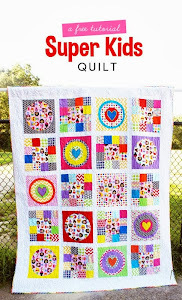 Linking up to Sew Cute Tuesday and Crazy Mom Quilts at Finish it up Friday. Picture overload here friends. Consider yourself warned. I am just so thrilled with this bag. I stayed up till midnight last night, hand sewing the lining into the bag and I had a hard time getting to sleep afterwards because I was so excited to be finished and that it looks great. I definitely feel like I am behind the times when it comes to sewing the trends- and getting into sewing the Weekender is definitely an example of that! I know I was intimidated- people really make a big deal about how difficult it is to sew this bag. But it's not that bad, honestly! I would even do another one. I did English paper piecing for this outside hexagon panel ages ago and it sat for a long time. Completing this long-standing WIP feels so good! This finish coincides with the May Le Challenge link-up with the theme word, "Blossom." There are lots of floral fabrics included in this bag but my favorite is this older Melody Miller linen weight fabric shown between the handles in this picture. I have a friend who told me she doesn't really like flowers in fabrics and I was surprised: that's definitely a difficult motif to avoid in fabric! Luckily I love them. In this post, I listed many tips about making the weekender. The only thing I would change is that I would encourage you to make your own piping. The piping designated in the pattern is much chunkier than the store bought piping and makes a bigger statement. Making my own piping this time around was easy. Now I am going to make my own for my daughter's dress- it's not hard! This typewriter square was the impetus for the color scheme of this bag. I won it in an IG giveaway. I installed an interior zipper pocket - something that will definitely come in handy I hope! I used instructions for how to do so via the Noodlehead 241 pattern- I definitely like her method. Linking up to Finish it up Friday and Le Challenge. After I finished the fox quilt top, as a little reward to myself, I allowed myself to make Charlotte another dress. Sometimes I get in a mode of wanting to make dresses all day everyday and that is just not practical- but it's so much fun! When I saw this donut fabric, I thought it would make an adorable dress for a four year old. Then I decided to make more of an event out of it and take a special trip to Annie's Donuts with Charlotte wearing the dress. Annie's Donuts is a locally famous donut place that is known to be delicious and to have a lot of variety. My initial impression was that it was a donut place that put candy bars all over their donuts, which truly isn't very appealing to me. But then I tried their Maple Old Fashioned and I finally understood the hype. It doesn't hurt that they have warm glazed donut hole samples available too. Charlotte was hesitant to stand in front of the counter and have her picture taken but she did great. The place was really busy and no one paid too much attention. Here's my crazy crew shown below. We had a fun morning. Nick and I didn't go too crazy eating donuts: we've both been trying to lose weight. Nick has lost 20 lbs and I've lost 10 (typical guy vs. girl dynamics when it comes to losing the pounds!). The pattern I used was the Oliver and S Bubble dress. So classically simple and a polished piece. The button selection at Hobby Lobby is awesome. It's tempting to start a button stash and just buy a ton there. The brand they sell is called Sew-Ology and the stuff is much cuter than anything I've ever seen elsewhere. How perfectly do these pink and white stripes go with this dress?! With so much to do lately, I felt a little silly giving time to this project, but I just couldn't get the idea out of my head and I figure when you're four years old, you can wear donuts! It's cute and fun. Life's too short to not make these fun projects now, before she's older and won't wear hardly anything handmade. Here's another scrappy project that was gifted to me by six guild friends who made this adorable mini quilt. They made this for me because of that retreat swap that fell very flat for me when I received nothing handmade. It's hanging in an honored spot in my sewing room. We had a guild event at a LQS where we all worked on our own versions of the Color Dive Quilt. In 6 hours I felt like I didn't make a lot of progress on my AMH HST's, but I had a lot of fun with my friends. Linking up to Scrappy Tuesday. I finished my Fancy Fox quilt. I am so happy with it! Close to completion, I was getting a little tired of the project but the effort was worth it. I started this at the February guild retreat, so it didn't languish in the WIP pile too long. I don't know if there's much more I can say about this project. Elizabeth Hartman is a talented designer and I enjoy her patterns a lot. I want to make many more of her other animal quilts. 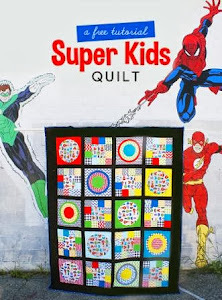 In the early days of modern quilting, her blog and first book were significant resources for me learning quilting techniques and I can thank her for the information I used when I finally took the plunge to try free motion quilting on my domestic machine. Do you notice the piping? I made it myself! It wasn't so hard after all. I would definitely do it again and it's much larger than the store bought stuff. I really wanted to sneak in a bit of that Catnap fabric, but I didn't want to have a big bag that made me seem like a crazy cat lady with cat faces all over it. This was a great compromise! Designing the end pockets were an almost easy decision. The typewriter was a no-brainer. Deciding on the other side took me a lot longer. I finally found a scrap of the double-gauze Princess and the Pea fabric. The scrap came from making this quilt and the yard piece I had used really looked like swiss cheese- I probably shouldn't have bothered to save it! But I am glad I did- I love that princess so much! I love her facial expression and body language- she is so cute and feisty. Making this bag has proved really therapeutic lately. Lately I have had a lot on my mind and sometimes my emotions feel overwhelming. I bring this up not to focus on my current stress level, but more to praise this hobby that is always interesting, rewarding, and fulfilling. Sewing at night, by myself, with a favorite show streaming from Netflix, has proved very therapeutic lately. I just don't know what I'd really be feeling if I didn't have this awesome and very healthy coping mechanism. Most people I know don't have a hobby or interest that they are really passionate about. I can't imagine that. Occasionally sewing adds to my stress level but more often than not, it truly provides an amazing outlet for me of expression, utility, and joy. This all probably sounds a little cheesy but oh well. Sometimes I feel compelled to explain why I do what I do. I'll be back on Friday with my finished Fancy Fox top.